As one of Country Music’s finest guitar players, Jimmy Capps is a ‘master of smoothness’. Throughout his career, Jimmy Capps has received numerous awards from the “National Academy Of Recording Arts & Science”. These are awards for playing on the ‘Most #1 Hit Recordings’ … thus making him a member of the “NARAS Superpickers Band” for the years 1978 & 1979. In 1979 he was also voted ‘Most Valuable Acoustic Player’. 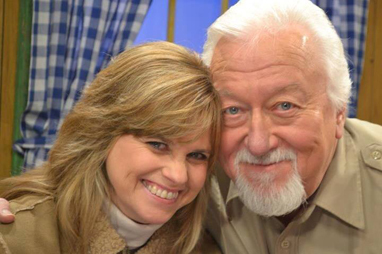 You can still see Jimmy and hear his wonderfully distinctive guitar playing every week on the Grand Ole Opry, and also on RFD-TV on the weekly shows “Larry’s Country Diner” … “Country’s Family Reunion” … “Wilburn Brothers Show” … …and more recently as the guitar playing “Sheriff” on Larry’s Country Diner on RFD-TV. This entry was posted in Danna's Radio Diner Archive and tagged Classic Country Music, Country's Family Reunion, Grand Old Opry, Larry's Country Diner, Lead Guitar, Recording. Bookmark the permalink.